Outgoing Georgian President Mikheil Saakashvili assailed Russia as "the last authoritarian empire in the world" during a speech to the UN General Assembly, and predicted that President Vladimir Putin would disappear from Russian politics, prompting the Russian delegation to walk out in protest. 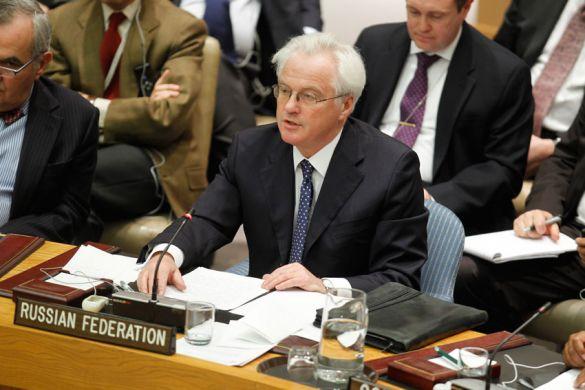 Russia's ambassador to the UN, Vitaly Churkin, decried Saakashvili's remarks as "crazy fabrications" and even "anti-Christian," and said the Georgian leader needed psychological help. Saakashvili, whose second and final term ends next month, warned that the Kremlin was using "constant pressures and threats" to establish a new Russian empire through the proposed Eurasian Union, a political and economic bloc of former Soviet republics. "It makes me sick when KGB officer Vladimir Putin lectures the world about freedom, values and democracy. This is the least of the things he can do to the world being the dictatorial leader of one of the last empires left," Saakashvili said. "But this new project [the Eurasian Union] is much more dangerous than his lectures. "The Eurasian Union has been shaped as an alternative to the European Union and unveiled by Vladimir Putin as the main project of his new presidency — the new Russian empire," he said in his 30-minute address. Putin first floated the idea of the Eurasian Union in October 2011, saying it would build upon the "best values of the Soviet Union," and Russia, Belarus and Kazakhstan subsequently signed an agreement to establish the grouping by 2015. Kazakhstan, Kyrgyzstan and Tajikistan have expressed interest in joining, and in a victory for the Kremlin Armenia's president agreed to sign up after holding talks with Putin in Moscow earlier this month. But Saakashvili, who has waged a battle of words with Russia for much of his nine years in office, said the Kremlin was playing dirty by strong-arming countries intent on joining the European Union into enlisting with the Eurasian Union instead. "Armenia has been cornered and forced to sign a customs union that is not in this nation’s interest or in the interest of our region. Moldova is being blockaded, Ukraine is under constant attack, Azerbaijan faces extraordinary pressure, and Georgia is occupied. Why? Because an old empire is trying to reclaim its bygone borders," he said, speaking in fluent English. Saakashvili predicted, however, that the Eurasian Union would fail and Russia would become a "normal nation state" once Putin left office. "A few years from now — you will recall my words — Vladimir Putin will have left the Kremlin and vanished from the Russian politics, even if he says that he will be [around] for another 20 years," he said. "Russian citizens will remember him as a ghost from the old times, the times of corruption and oppression. "Nobody knows whether this process will be calm or violent, whether his successor will be nationalistic or liberal, or both together. But what matters is something else: Russia will no longer be an empire; it will become finally a normal nation state." Also in the speech, Saakashvili accused Russia of destabilizing neighboring countries, including Georgia by supporting its breakaway republics of Abkhazia and South Ossetia, and lashed out at the Russian Orthodox Church, whose clout has grown under Putin. "When we hear the fake music of the Orthodox brotherhood sung by Russian imperialists, can't we hear the true voices of Patriarch Kirion, who was assassinated, or the eternal voice of the Patriarch Ambrosi Khelaya, who was tortured during days and weeks only because he appealed to the Geneva Conference against the invasion of his country? And he told his Russian interrogators: "You can have my body, my flesh, but you will never have my soul,'" Saakashvili said. "Are we so deaf as not to hear the voices of the killed bishops and priests tortured by Russian imperialists and Russian communists? Are we so uneducated we do not recall who has repainted our churches and erased our sacred frescoes? Are we so blind today not to see the destruction of our churches by the same people who erased our churches in 19th-century Russia now in the occupied territory?" The Russian delegation listened to the first 20 minutes of the speech before walking out, according to Georgian news reports. A Russian Foreign Ministry spokesman confirmed the demarche. "As a token of disagreement with the assessments voiced by Mr. Saakashvili from the General Assembly rostrum, Russian representatives walked out of the hall," spokesman Alexander Lukashevich said. Churkin, Russia's ambassador, was blunt in his assessment of the speech, the longest of the nine addresses that Saakashvili has delivered at the UN every year since being elected in 2004. "This time it wasn't even a speech but a set of crazy fabrications that are in nature not just anti-Russian, but also Russophobic and anti-Christian," Churkin said in a statement. "Luckily for the Georgian people, this man — whose mental state needs a professional evaluation — is in the twilight of his political career." The Russians were the second delegation to walk out at the UN General Assembly this week. The Israeli delegation left during a speech by new Iranian President Hassan Rouhani on Tuesday in what Prime Minister Benjamin Netanyahu called a protest against Rouhani's refusal last week to recognize the Holocaust as a historical fact. Curiously, Rouhani publicly acknowledged the Holocaust as a historical fact during an interview with CNN later Tuesday. Georgia is scheduled to hold a presidential election on Oct. 27. Saakashvili, who under the Constitution cannot seek a third term, will hand over much of his power to billionaire Prime Minister Bidzina Ivanishvili, who made his estimated $6 billion fortune in Russia and was elected last year. A government reform calls for much of the presidential authority to be transferred to the prime minister after next month's election. U.S. President Barack Obama, whose relations with Saakashvili have been notably less warm than those of President George W. Bush, praised the Harvard-educated Georgian leader during a brief conversation on the sidelines of a UN event on Monday. “You are leaving a great legacy of democracy and a reformed Georgia. 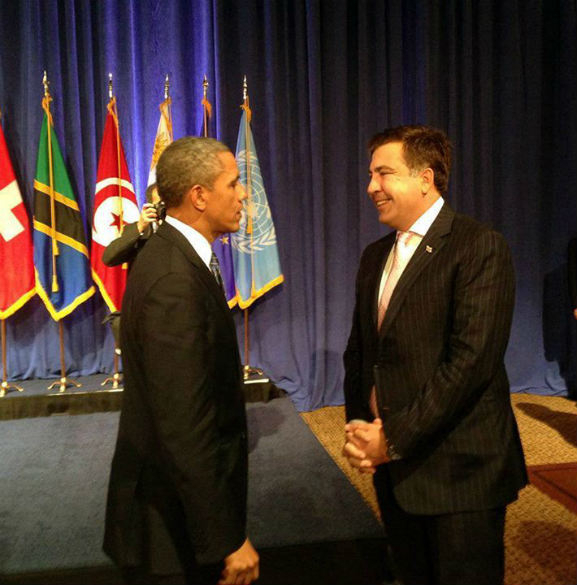 What are you planning to do next?” Obama asked him, the dfwatch.net website reported, citing Saakashvili’s staff. Saakashvili said he would work in education and lay the groundwork for a presidential library. "That is a terrific idea!” Obama replied. 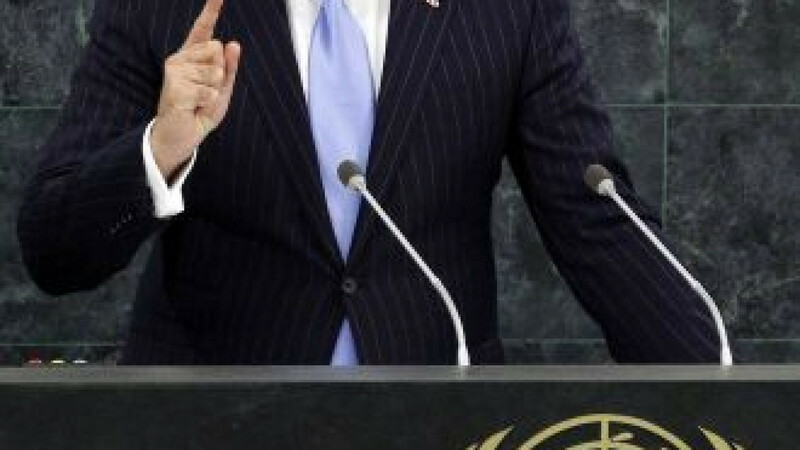 A video of Saakashvili delivering his 30-minute speech to the United Nations General Assembly.